In 1979 the Iranian revolution kicked the Shah out, closed the American embassy taking 53 Americans hostage, and regained control of oil fields. After the failure of Operation Eagle Claw to rescue the hostages the US and Iran signed the 1981 Accord in Algiers according to which Iran released the hostages and the US agreed not to intervene politically or militarily in Iranian affairs. The US, then, pushed Iraq’s Saddam Hussein into eight years war against Iran. Although the war devastated the country, the Iranians used the oil revenue to later rebuild and to modernize their country. Yet the Zionist Khazars were not satisfied with the deal and Israel never stopped lying about the alleged secret Iranian nuclear bomb program. Trump’s administration joined in expressing its dissatisfaction with the Iran nuclear deal stating that it was horrible, one sided and had failed to protect American national security, and eventually unilaterally withdrew from the deal in violation of the UNSC resolution. Trump wanted to draft what he called a more comprehensive deal that would address the full range of Iran’s activities, including its ballistic missile program and its alleged destabilizing military interventions in the region especially in Syria threatening Israel’s security, and its alleged sponsor of terrorist groups; Lebanese Hezbollah, Palestinian Hamas and Yemeni Houthis; all labeled as terrorist groups by the US, Israel, Saudi Arabia and UAE. Claiming a policy to modify Iranian regime behavior, not a regime change, Trump’s administration demanded that Iran capitulate to a dozen tough demands otherwise suffer the “strongest sanctions in history” as emphatically stated by the Secretary of State Mike Pompeo. It is Israel, not Iran, that has a secret nuclear weapons program as accused by courageous Jill Stein; the 2016 nominee for the American presidency. Israel seemed to have upgraded its nuclear arsenal with smaller tactical bombs and had used them at least twice to bomb its Arab neighbors; once in Yemen and another in Syria. In May 20th 2015 two Israeli F-15 fighter planes painted with Saudi insignia (Saudi Arabia does not have F-15 planes) dropped what is believed to be a neutron bomb on Yemen. It was revealed by Russians that analysis of videos taken of the attack revealed proton bombardment from a neutron bomb. Receiving no international condemnation of this crime, Israel was emboldened and dropped another tactical neutron bomb on Hama, Syria, on Saturday night of 28th April 2018, whose tremor recorded a magnitude of 2.6 earthquake on European seismic monitoring stations. 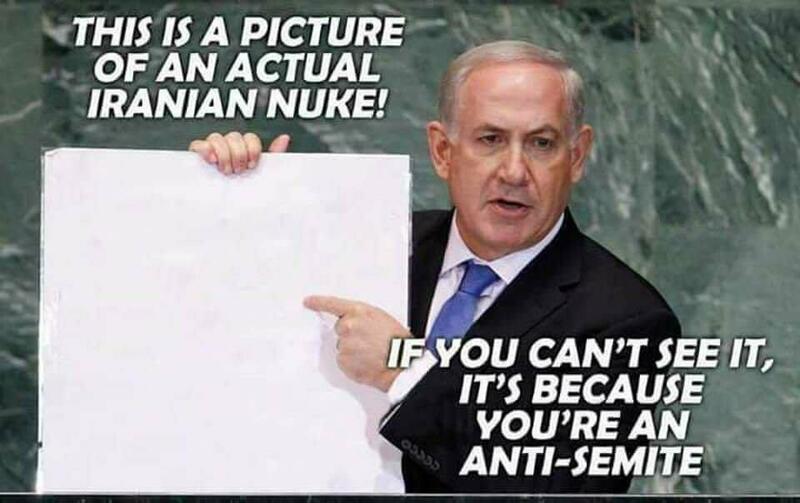 Israel is a rogue nuclear state that is not a party in, and refuses to sign the NPT. Iran has never created, trained, financed, or armed any terrorist groups to destroy its neighboring countries, but has been fighting them on its own borders with Pakistan, Afghanistan, Turkmenistan, and in Iraq and Syria. Yet Trump’s administration is accusing Iran of terrorism. Trump accused “no matter where you go in the Middle East, you find the finger prints of Iran.” Actually, it is the Israeli/American terrorist finger prints that could be detected in every Middle Eastern country. The US created, trained, and armed terrorist groups such as ISIS and its sister shoots. When terrorists got defeated in Deir Ezzor American helicopters evacuated their leaders. US and UK had also helped terrorists move back to Europe as reported by BBC. After the liberation of terrorists controlled areas in Syria, such as Ghouta, the Syrian army found large underground storages of American and Israeli weapons, including chemical weapons and American equipment to manufacture chemical weapons (here, and here). Iranian president; Hassan Rouhani, responded to Trump’s threat of sanctioning Iranian oil with a warning that also carries what could be a peace offering. “… America should know that peace with Iran is the mother of all peace, and war with Iran is the mother of all wars.” Rouhani stated. War against Iran would involve at least all American military bases in the Gulf, all the Gulf states, Israel, Lebanon, Syria and Iraq. Turkey, Russia and China may somehow get involved. Iran threatened to close the Strait of Hormuz; the entrance to the Persian Gulf, against all oil exports. Yemeni Houthis also threatened to close Bab al-Mandab Strait; the entrance to the Red Sea, against all marine traffic. These closures would cause great economic impact on the whole world. In Trump’s trade war the US seems to stand alone and isolated. American economy, although the world’s largest, would suffer greatly. Great article, like many of here. Keep up the good work.